On the second day of our field trip we visited a pineapple plantation. This specific plantation produces for various brands such as Dole and Whole Foods. It is certified fair trade plantation, meaning that they take specific measures to provide equitable conditions for their workers (such as wages and facilities on the plantation and in the community) and this guarantees the growers a price floor and a premium for the labeling. The plantation actually grows 60 percent conventional and 40 percent organic. In 2004 they actually switched to completely organics but when the recession hit in 2008 they were no longer able to find enough markets for their organic products and still maintain the price premium (which covers the extra costs of organic production). Here is the tractor that pulled the little wagon/train that all of us rode to get to the fields and where our guide (yep still strange that there are guides, I just can't imagining flying to Latin America to see pineapples) explained to us the planting and harvesting processes. Here is what the pineapple fields look like. 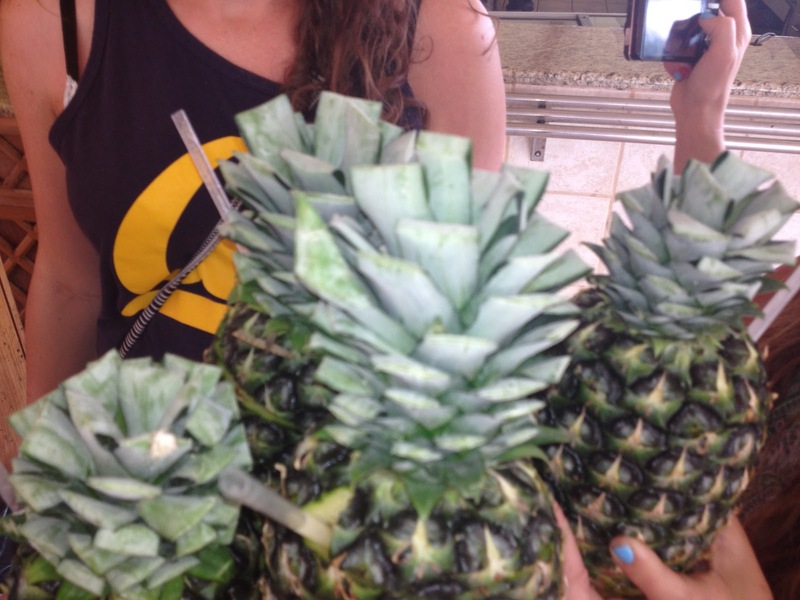 Pineapples are actually grown on a plant that resembles and aloe bush. Only one pineapple grows from the crown of each plant. Here is what the plant looks like with a pineapple sticking out from the top. This is the machine that is used to harvest the pineapples. They are actually each picked by hand and just placed on the back of this tractor for transportation purposes. 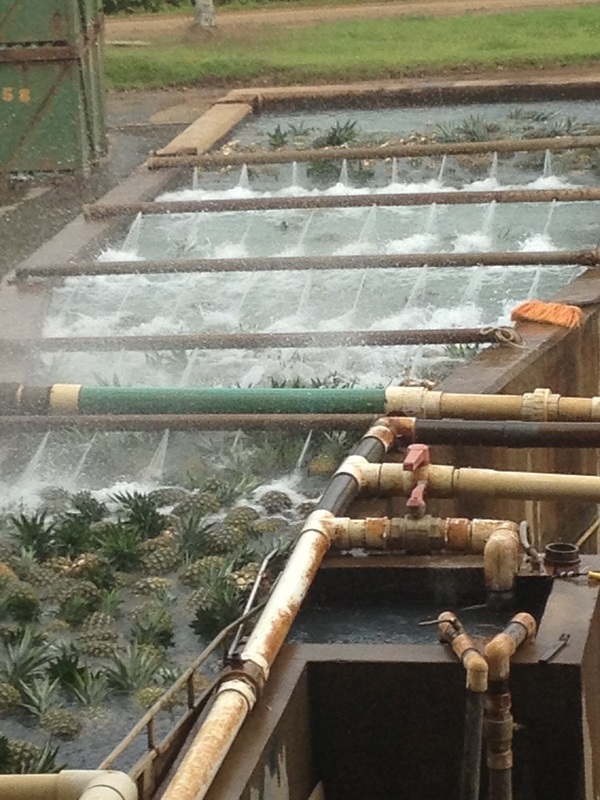 See the pineapples take a bath too. These specific pineapples came out of the organic fields and it will take them 8 days to make their way from Costa Rica to a port in the United States. And here are the pineapples they served us afterwards that were filled with pina colada. Yummy!!!!!!! Both the pineapple and banana trips were very interesting because they further emphasized how ridiculous consumers are and how are lack of understanding drives the market. For bananas because no one wants them with spots the producer goes through all this extra work and wastes a ton of plastic in order to keep them safe during the transportation from field to box. Not to mention the fact that people try and find straight bananas even though it is rooted in a bananas genetics to grow bent. And in the pineapple production the conventional pineapples are actually sprayed with extra chemicals that prevent them from ripening thoroughly just because most people think that a pineapple with yellow on the outside is more ripe; which is not true at all. A pineapple can be completely green and be absolutely delicious. Also Americans like larger pineapples and Europeans like smaller pineapples. Very strange. I guess what continues to fascinate me about food studies is the fact that so much of how and what we eat comes from a lack of understanding of how food grows and where it comes from. I think we all just need to spend a little more time getting our hands dirty and either growing some of our own food or working in a community garden. Because really it is amazing, it is a wonderful process that a small tiny little seed/flower can be something as complex and beautiful as a pineapple.